A luxury shoe company has been criticised online after releasing a pair of kitten healed flipflops that cost £455. 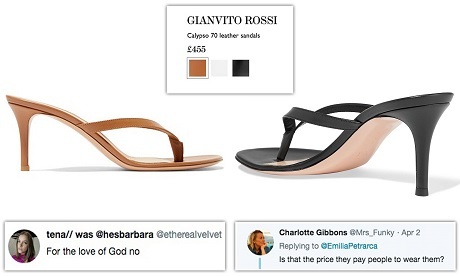 The sandals by posh brand Gianvito Rossi, which is loved by the royals, led to one unimpressed person on Twitter dubbing them 'disgraceful'. A tweet about the fancy footwear from a New York fashion writer was met with ridicule by fashion fans who seemed to fear that the noughties staple could be returning to their wardrobes this summer. On Net-a-Porter, a description for the shoes states: 'Neutral shades and barely-there sandals are so big for Spring '19, and Gianvito Rossi combined both trends to create this exclusive pair. 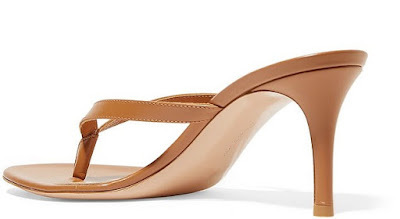 Gianvito Rossi shoes are a staple for both Meghan Markle, the Duchess of Sussex and Kate Middleton, the Duchess of Cambridge. Other stars including Demi Lovato, Charlize Theron and Karlie Kloss have been spotted wearing the Italian designer's shoes. Can't even call this kitten heel.